The British government won't allow women to take the abortion pill at home, despite overwhelming evidence that it's safe. Now an abortion provider is taking the issue to court. Sarah Boseley of the Guardian writes that the abortion pill requires two doses, taken 24-48 apart. In most countries, the US included, women can take the second dose — which causes uterine contractions — at home. 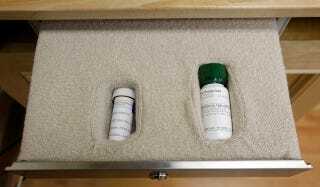 But in Britain, they have to return to a clinic to take it, meaning they're at risk of beginning their contractions while in transit (almost all women choose to return home after taking the pill, meaning the clinic requirement clearly doesn't include additional post-dosage monitoring). Experts say there's no medical reason women should have to leave the house to take the second pill — some have called the requirement "ludicrous and stupid." So why hasn't the British government axed it? Apparently, they're scared that letting women take the second dose in the privacy of their homes will be seen by the media as encouraging abortion. Says Ann Furedi of the British Pregnancy Advisory Service (BPAS), "It is astounding how terrified they are of the Daily Mail." What we really believe is that our clinical practice must be shaped by clinical evidence and not political convenience. The fact that it may be controversial and may provoke those who oppose abortion in principle to rally against these particular changes should not be a factor that we take into consideration. The world over, people seem to forget that abortion is a medical procedure that should be governed by medical — not ideological — concerns. The debate over the abortion pill in Britain is reminiscent of the one about so-called partial-birth abortion here, or the related warfare over the morning-after pill (which, it's important to note, is not an abortion pill). In all these cases, conservatives disregard what's best for women in favor of their own moral requirements. Let's hope BPAS can convince the British government to pay attention to medical science and women's health instead.